RiverBend Motorcoach Resort RV Lot 127 is situated on the east end of Geary Lake with a spacious common area at the rear of the lot and a beautiful view of the lake and fountain. 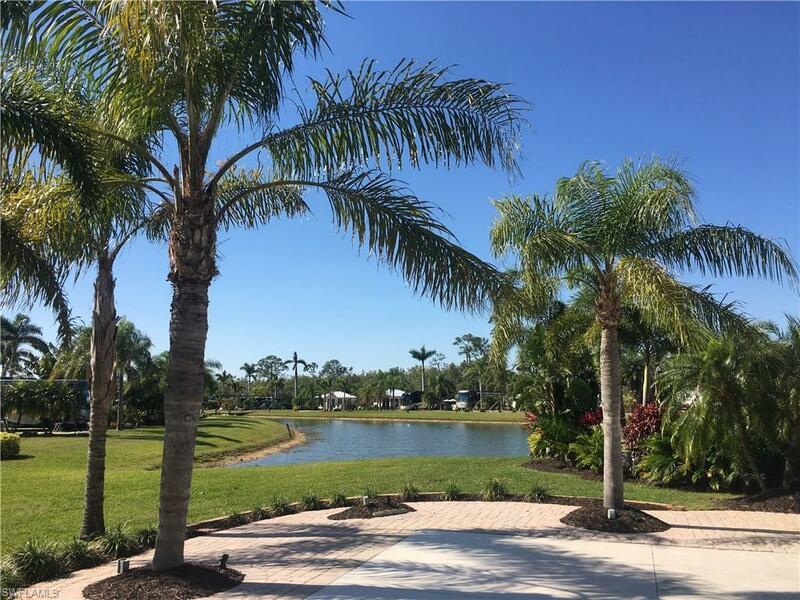 Relax among the towering palms on the large paver patio in the warm SW Florida weather and enjoy the lake view. A short walk to the pool complex makes this a great resort location.The 10x14 coach house is unfinished with french doors with built in blinds, electric panel and provides lots of storage options. This gorgeous Class A Motorcoach Resort is full of friendly people and provides a special sense of community. The streets and lots are wide and designed for ease of use. The resort includes over 1000â of river frontage on the Caloosahatchee River with boat ramp, slips and trailer/boat storage. There is a Welcome Center with gated entrance and 2 clubhouses that include restaurant, full bar, dining areas, billiard room, library, exercise rooms and laundry. RiverBend also has an R/C Speedway, Railroad Village and Sailing Club. Amenities include heated pool, 2 jacuzzis, pickle ball, bocce ball, volleyball, shuffle board, covered picnic areas, BBQ grills, putting green, horseshoes, crafts and a dog park.